DORIS at Amsterdam Island is out of vertical by a few cm. Replacement is planned for next April. DORIS Starec antenna at Rio Grande has been moved to a new support in order to improve its stability. The antenna was out of vertical to several cm toward North. 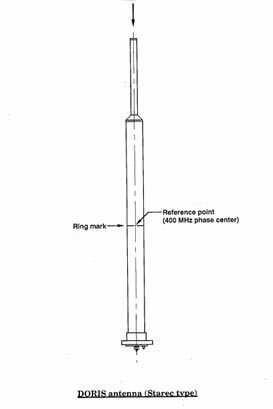 The stability of the DORIS antenna at Santiago has been improved, by replacing the current guyed 2 m tower (transmission until Feb. 20) with a very rigid, 45 cm sided, triangular metal tower (transmission after Feb. 28). The old Alcatel antenna at Easter Island has been replaced with a Starec one installed on a new support metal tower. Old antenna stopped on Feb. 23, and resumed on Feb. 26 from a new antenna. 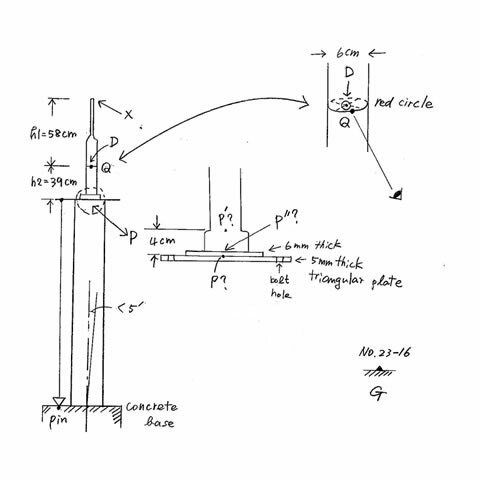 The corroded supporting plate of the DORIS antenna at Amsterdam Island was changed on March 28, with a new plate of high quality stainless steel. A new Starec antenna was installed. The DORIS Starec antenna at Kerguelen has been moved to a new support in order to improve its stability. Transmission at former position stopped on April 1, and resumed on April 4 from a new location. 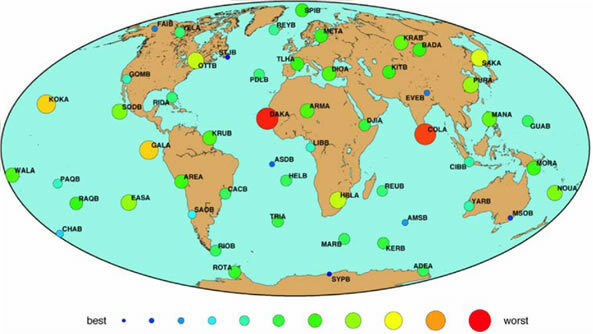 On 23 June 2001, a major earthquake with M = 8.4 occurred near the coast of Peru. The DORIS antenna at Arequipa (190 km east from the epicenter) showed a displacement of about 30 cm. The DORIS Alcatel antenna at Arequipa, installed 12 years ago, has been replaced with a Starec antenna, installed on a concrete pillar. Transmission at former site stopped on November 20, and resumed from the new site on November 21. The current support of the Starec antenna at Chatham (NZ) has been replaced with a more rigid tower. Before removal of the old support, the centering of the antenna was checked. Corrosion of the aluminum supporting plate had caused a small tilt of the antenna to (2.9 mmE and 0.5 mmN) for the 400 MHz phase center, and (5.6 mmE and 0.5 mmN) for the 2 GHz phase center from the ground. The station will be used by the onboard navigator (DIODE) of the new DORIS instrument on Jason-1. The DORIS station at Yaragadee, initially installed in 1992 and already upgraded with a Starec antenna in 1999, has been renovated again. This renovation consisted in moving the antenna to a new support in order to improve its long term stability without any change of the type of equipment. Transmission from the former position (YARB) stopped on November 27, and resumed on the same day from the new position (YASB). A new DORIS station has been installed at Crozet Island. 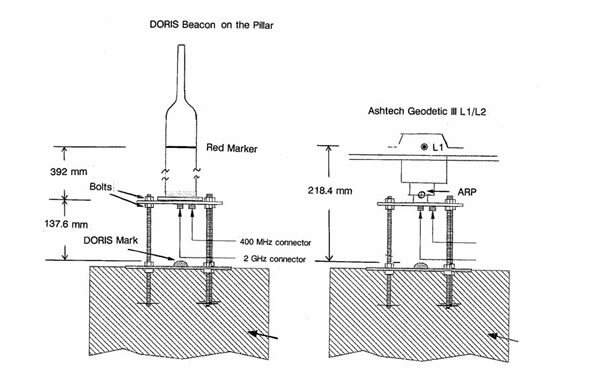 The DORIS equipment consists of a third generation beacon and a Starec antenna. A new DORIS station has been installed at the “General Belgrano” Argentine base in Antarctica. At almost 78 degrees South latitude, this is the southernmost DORIS station ever installed (on an outcrop). 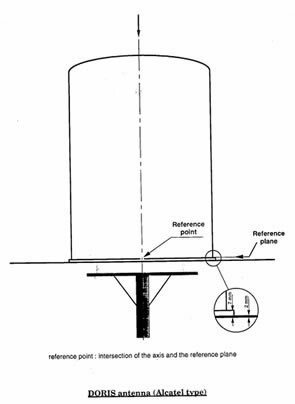 The DORIS equipment consists of a second generation beacon and a Starec antenna. Transmission started on February 6, 2004.
initial deployment to its renovation. J. Geod., 80(8-11), 429-456.